A Newer Blog Entry on Cupertino Trends is HERE. Note: Want to be notified of updates? Subscribe to this blog by entering your email on the Subscribe box on the right. The Cupertino Real Estate market trends continue to show competitive bidding conditions and homes going way over asking prices, as we move into Summer of 2013. In the month of May 2013, home buyers competitively bid for properties in the market as has been the case since the beginning of the year although the inventories have opened up quite a bit. 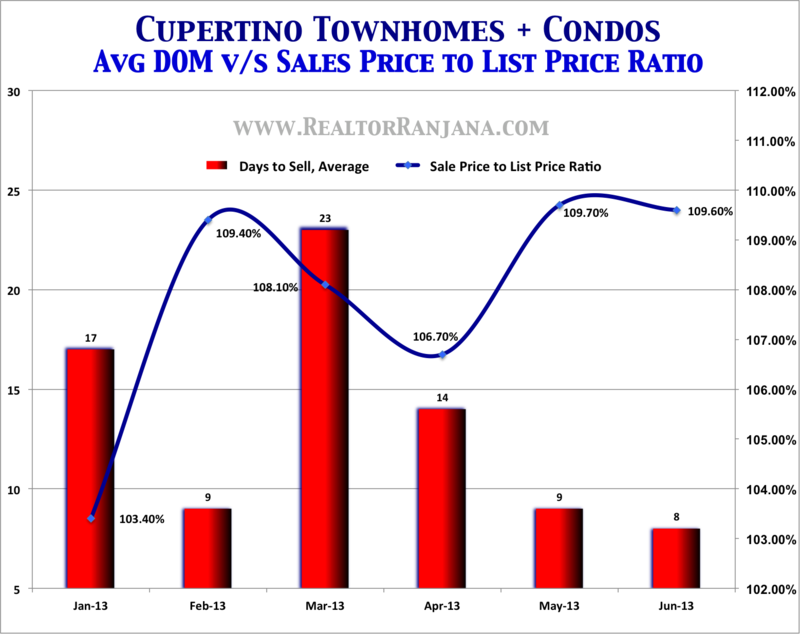 Do you wonder why Cupertino real estate market is so crazy, and why do buyers compete so hard for Cupertino properties? Here's a very good reason - Buyers come to Cupertino mainly for its uniformly high-quality schools ranging from elementary to high schools. Buying a home in Cupertino enables families to stay for many years till the kids graduate out of school. In addition, the access to most Silicon Valley employers, and amenities is very attractive. After a few select Single Family Homes in Cupertino stayed a little longer in February 2013, while most others sold in very few days after listing, the Average Days To Sell number was higher in February at 27. Since then, Single Family Homes have been selling briskly with heavy competitive bidding and selling within days such that the Average Days To Sell had come down to just 11 days in May 2013. In June 2013, the trend continued albeit pushing up the number of days in market to 15 days. The Cupertino Real Estate Market Trend Chart above shows interesting trend lines ( see the blue line for Sales Price Over List Price Ratio and the Red Bar Chart for Average Days To Sell). The competition for houses among buyers is so strong that many Cupertino home sales over the last 3 months (April, May and June) were at unbelievably significant premiums over the list prices. In some cases, it was not uncommon to find homes going $100k to $200k over list prices. The Average Sales Price over List Price ratio jumped to 108.8% in April 2013, 107.4% in May 2013 and 111% in June 2013. In the case of Townhomes and Condominiums in Cupertino, the demand has been stupendously high with even more competitive bidding happening over the last few months. In the chart above, the Average Days To Sell is the Red Bar Chart while the Average Sales Price To List Price Ratio is reflected in the Blue Line Chart. As you can see, Townhomes and Condos sold extremely fast in June 2013 with the average duration of just 6 days after touching highs of 23 days in March, 14 days in April and 9 days in May 2013. The trend with respect to pricing is clearly visible in that the Cupertino Townhomes and Condos are selling at an average of 109.6% over list price in June 2013, similar to May 2013. In earlier months, the Average Sale Price Over List Price was well over List Price ranging from 103.4% in January to 109.4% in Feb, falling to 108. 1% in March and to 106.7% in April before taking its upward journey again in May 2013. Single Family Home Active + Pending inventories in Cupertino have been steadily improving over the last few months. The May 2013 Active + Pending Inventory at 54 represented a 58% jump in inventory from the January number of 34. In the case of Townhomes and Condos in Cupertino, there is a pronounced shortage of Active + Pending Inventories although the situation has somewhat improved. As of May 2013, only 16 active homes were in the Cupertino market representing a jump of 50% from the January 2013 number of 8. Source for data: MLS Listings - data considered reliable but not guaranteed to be accurate as more incoming updates can change source data. 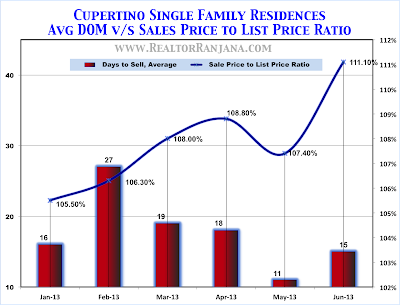 Looking for Cupertino Real Estate Area Recent Home Sales? I will be very happy to help. As Summer moves forward, one can expect the Cupertino Real Estate market to continue seeing growing buyer demand due to schools closing and people more willing to move. Added to that the still low interest rates (although they have crept up a quite a bit over last couple of months) keeps the buyers coming in. Although inventories have improved, with such high premiums over List Prices, there is hope that more homeowners who are getting ready to sell will turn into actual sellers in order to cash in on the great opportunity to maximize their return on investment. With economy continuing to expand and banks funding mortgages more readily, the Cupertino real estate market with its great schools will tend to always see brisk demand for houses on sale during the buying season over Summer 2013. We hope that more inventory comes into the market to ease the situation for buyers. Thinking of Selling? Call Me Today! 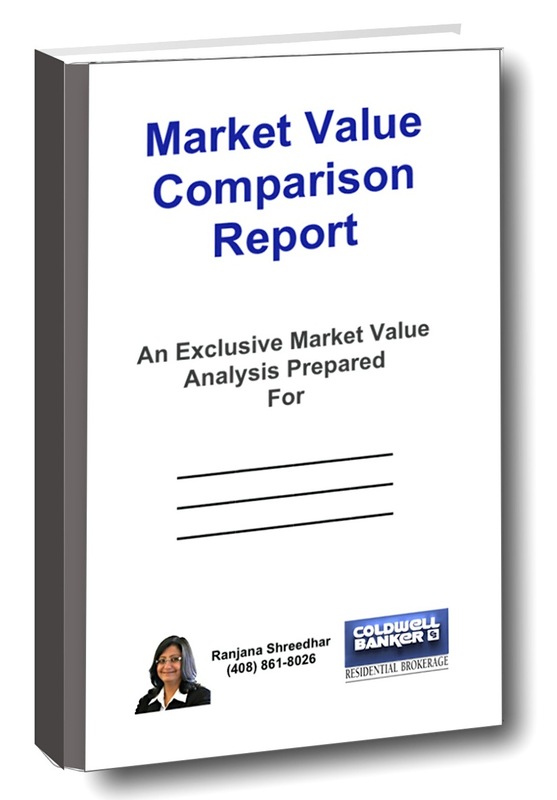 Receive a free, no-obligation market price evaluation of your home. Want to tour any of these homes? Call me at (408)861-8026 to set up a time. You guys has a good job for your homes for sale. Keep it up!